This website is dedicated to all the spiritual aspirants, who have a quest to excel in spirituality. This is an attempt to collect all the information regarding advaita vedanta and also other branches, which lead to Moksha. It is an effort to make a database and links to other useful sites which you can visit. If you think that the content on this website is yours, please email at indianspirituality@gmail.com, along with the URL from which the content has been adopted. As I may have collected this content before a long time for personal reference, I have collected all URLs. References and Acknowledgements section will soon be added, were all the site references and URLs will be given. This site will always be under construction and I will update it whenever I get time. This page gives some of the inspirational quotes by Sri Ramakrishna, Swami Vivekananda, Sri Ramana Maharshi, Swami Chinmaya, Swami Tadrupanand, Sri Shirdi Sai Baba, Lord Buddha, Sadguru Jaggi Vasudev, Paramhansa Yogananda, Sri Sri Ravi Shankarji, Bhagawat Gita and others. This section contains photos of different saints, and other deities. Once Swami Tadrupanand said during the discourse of Gita "Now-a-days it has become a trend to read Gita, without having the knowledge of the Prakaran Granthas". These Prakaran Granthas are the stepping stones of advaita vedanta. Gita is the essence, i.e. in prescie or concise form. So it contains everything, but not in the elaborate form. 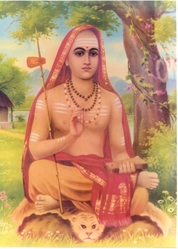 These granthas were created by Sri Adi Shankaracharya and familiarize us with the technical terminology and concepts of spirituality, specially in the advaita vedanta. So before reading Gita, one must read and understand these preliminary texts. Tatva Bodh, Vivekchudamani, Aparokshaanubhuti, Updeshsahastri.